It's been a while. So as part of my attempt to blog a bit more often I've decided to start a 365 photo project. With my new Mac finally arrived (a very long story!) I'm inspired to get a shot taken and edited everyday and the cunning 'blog it' link on flickr might just make this all a but easier. I only managed 98 days of photos last year, so hope to emulate my success of 2009 where I completed the whole project! So here's number one. 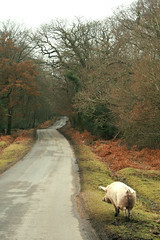 A lovely big pig strolling through the wintery New Forest. Here's to the next 364. ║╔╗║╔╗║╔╣╔╩╗╔╝ ★ NEW YEAR ☆ 2011! !